Hanukkah, Christmas, Kwanza, New Years … they’re all approaching fast. Which means you should be preparing for your Holiday feast. What’s that? You’re not ready?? Not sure what to make??? Never fear … Caveman is here! Just read on for some suggestions on how to make your celebratory spread highlight your time with friends and family. Of course, nothing piques an appetite quite like some sumptuous appetizers. You could throw a bowl of nuts on the table and call it good. Though, at C3 we take our pre-meal hors d’oeuvres pretty seriously. 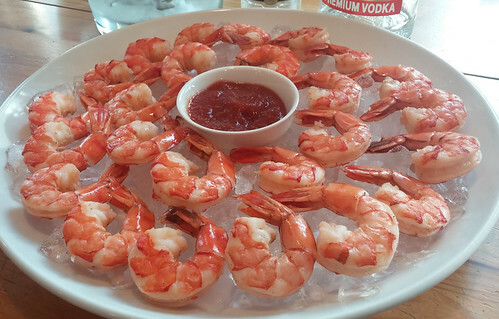 A recent favorite of the Cave crowd has been Cavey’s Colossal Shrimp Cocktail. These giant seafaring crustaceans are plump, succulent, delicious, and relatively easy to make. Plus, you can make them ahead of time, and then plate them just before your guests arrive. Other tasty starters include our Baked Brie with Peach Sauce; Lamb Wontons, Teriockeye Salmon Wontons, or – if you are feeling fancy – our incredible King Crab Wontons. 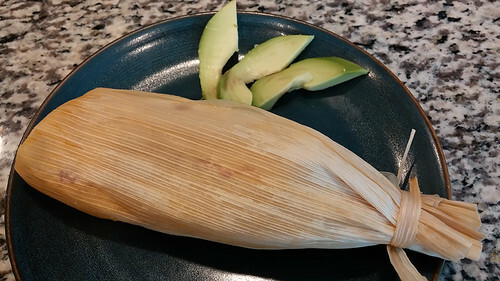 With Hispanic influences solidly embedded into California cuisine, it is no surprise that Tamales are a savory Christmas tradition that we have heartily embraced in the Cavehold. While we are solidly in the Gringo category on the census questionnaire, we will hold our Killer Chili Rojo (Red Pork) Tamales and Killer Queso (Cheese) Tamales up against any competition from South of the border. The masa (dough) in these two recipes is smooth, almost creamy, with a fantastic flavor all on it’s own, while the fillings are so scrumptious and hearty. A perfect blend that makes for a fiesta for your taste buds. While they are labor intensive recipes, it really is a very easy dish to pull off. Besides, if you gather your masses together for an assembly line when it comes time to actually fill and roll the tamales, it goes by very quickly. Side dishes are always a key to making any Holiday meal a memorable gathering. 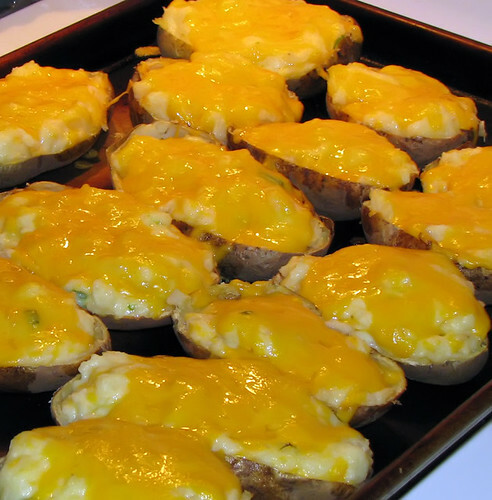 2x Baked Potatoes are always a welcomed Holiday treat. Yes, they are truly the “angioplasty special”. But, you aren’t starting your New Year’s resolutions for another week or so! Besdies, it’s the Holidays … live it up!! If you need to tone it down a bit, you could always opt for our Roasted Red Balsamic Potatoes for a tasty tater alternative. Other sides you might consider are our Sauteed Asian Veggies, Caramelized Red Pear Salad, and our annual must-have Super Spinach Soufflé. You can’t go wrong, no matter what you choose. The main course usually goes one of two ways for the Holidays: turkey or beef. Since we recently enjoyed a T-day Turkey Brined bird over Thanksgiving, along with some Phenomenal Focaccia Stuffing, we are opting for our world renowned Glazed Teriyamic Prime Rib. Whether you call it Prime Rib, Standing Rib Roast, or a bone-in Ribeye Roast this is one recipe that is full of flavorful nuances. It is a delectable dish that will have everyone at the table silent, save for the occasional mewl of palatable pleasure. A sweet treat is always the way to end a marvelous meal. Unfortunately, the Cavewoman does most of the baking and dessert making around here, and the vast majority of her incredible recipes have yet to make it onto this cyber rag. However, we do have a few posted up that might merit consideration. 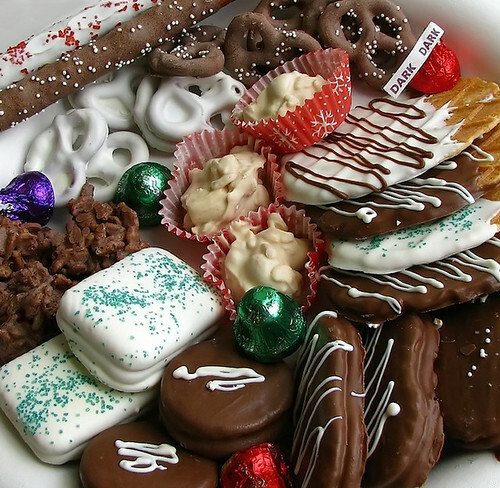 At the top of the list are her Hand-Dipped Holiday Cookies and other treats. These are an easy way to take some of your favorite store-bought cookies and turn them into something special to cap your Christmas-Hanukkah-Kwanza-New Year’s soirée. Plus, you’ll see that you also get to make pretzel/nut clusters, as well … my personal favorite. Some other temptations include our Pumpkin Whoopie Pies, Easy Peasy Cherry Crumble Cake, or simply top some ice cream with either our Cognac Marinated Mint Strawberries or Candied Kahlua Pecans. Any of these will certainly put the finishing touches onto your Holiday bill of faire. I know! I know!! I’ve given you so many options to choose from. But, isn’t that better than being stuck in menu limbo like you were before you read this post? Yeah … I thought so! Besides, you could always just celebrate ALL the Holidays … it will give you an excuse to make more than one Holiday meal! 😉 Let us know how it goes. The entire Cave clan wishes you a happy, healthy, and delicious Holiday season. ©2016 Caution: Caveman Cooking/UHearMe, Inc. All rights reserved. This originally appeared on the Caution: Caveman Cooking blog at http://cavemancooking.net authored by Caveman. This may be shared and reprinted as long as this entire copyright message accompanies it. … to you and yours, a wish for the very best this Holiday season, and always! ©2014 Caution: Caveman Cooking/UHearMe, Inc. All rights reserved. This originally appeared on the Caution: Caveman Cooking blog at https://cavemancooking.wordpress.com authored by Caveman. This may be shared and reprinted as long as this entire copyright message accompanies it. 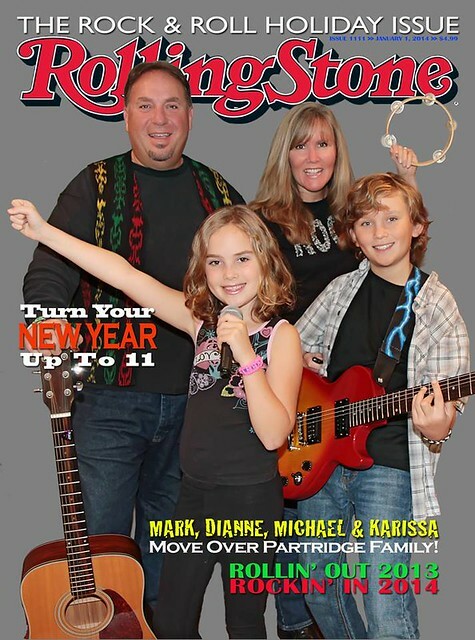 … to you and yours, a wish for a healthy, happy, and rockin’ Holiday Season! The Cave Clan wishes you a happy and healthy New Year, and all the best in 2013! ©2012 Caution: Caveman Cooking/UHearMe, Inc. All rights reserved. This originally appeared on the Caution: Caveman Cooking blog at https://cavemancooking.wordpress.com authored by Caveman. This may be shared and reprinted as long as this entire copyright message accompanies it. 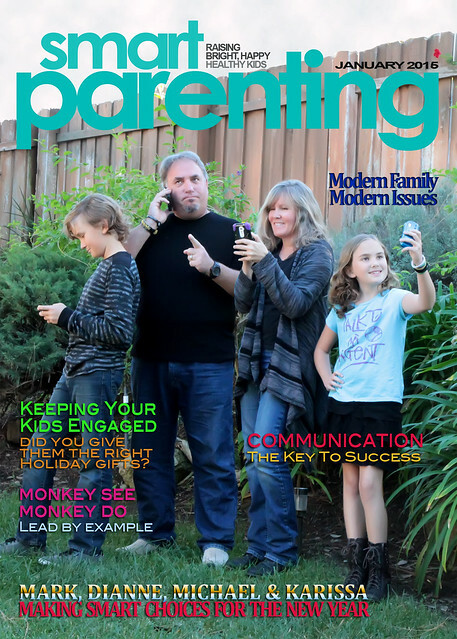 As previously noted on this cyber-rag, we like to have fun with our Holiday cards in the form of mocked-up magazine covers. We’ve spoofed such periodicals as People, Poker Player, American Angler, Photography and, last year, Bon Appétit. 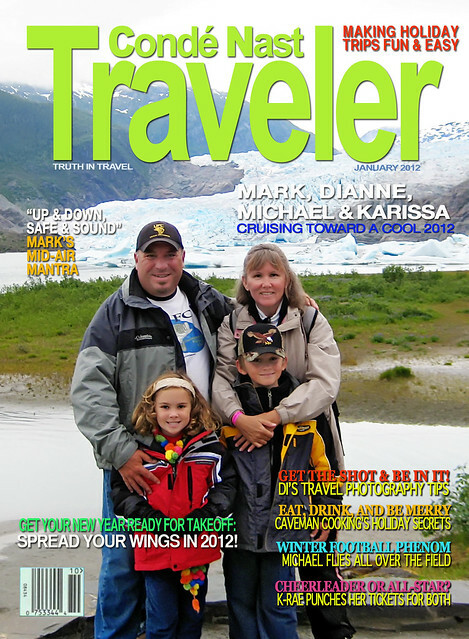 This year, after taking the trip of a lifetime to Alaska aboard the Disney Wonder, we felt that travel was the next “victim”. The result: Our 2011 version is a tribute to the well established trekking mag, Condé Nast Traveler! Yes, that’s really us standing in front of Mendenhall Glacier!! We have much to be thankful for in the Cavehold this Holiday season: Our troops are coming home after 9 arduous years in Iraq. After several serious challenges this past year, our family appears to be happy and healthy. Our highly anticipated “C3TV” premiered to much fanfare and acclaim. And, we are surrounded by so many amazing and wonderful friends and family members! Are things “perfect”? Of course, not … they rarely are. But, we always strive to see our proverbial glass as full as can be. So, please, take a moment this Holiday season to ponder the things in your life that bring you joy, happiness, and contentment. Give thanks for that which you do have, and aspire for that which you still seek to find it’s way into your life in the New Year! The entire Caveclan wishes you and yours the best Holiday season, ever! 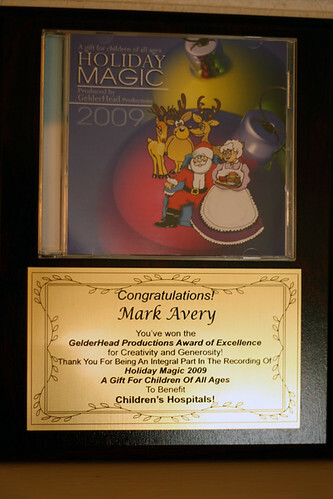 ©2011 Caution: Caveman Cooking/UHearMe, Inc. All rights reserved. This originally appeared on the Caution: Caveman Cooking blog at http://cavemancooking.net authored by Caveman. This may be shared and reprinted as long as this entire copyright message accompanies it. 2009 was a difficult year for most people I know. It was no different for the Cavepeople. Though, since you undoubtedly had your own dilemmas, I won’t bore you with the litany of ours. But, as the final month unfolded we began to feel a shift in our personal situation.